As a little kid, we’d go down to Waikiki Beach and visit my grandmother at the Uluniu Swimming Club. Back in those times, it seemed like it was a place only grandmothers went; from my sub-four-foot perspective, the place was packed with old ladies. It figures, Uluniu was originally founded as the Women’s Auxiliary of the Outrigger Canoe Club. The facility was right on Waikiki Beach between the Royal Hawaiian Hotel and the Moana Hotel, next door to the old location of the Outrigger Canoe Club. I remember the hau-covered trellised walkway into the club. Shortly following the organization of the Outrigger Canoe Club in 1908, wives of members demanded facilities for women at the Club so they, too, could enjoy the ocean waters in front of the Club. The Women’s Auxiliary provided women and girls with a recreational environment, away from the men’s club. In 1914 Uluniu was the first women’s club to be affiliated with the Amateur Athletic Union when Ellen Fullard-Leo became the first woman member of the AAU. In 1925, the Club separated from the Outrigger and became the Uluniu Women’s Swimming Club, accepted male spouses as non-voting members, and sponsored swimming programs, meets and competitions with trophies sought by local high schools. The Swanzy Cup, named for Julie Judd Swanzy, the first club president, was given to individuals, mostly for high school swimmers. The Uluniu Bowl trophy was awarded to teams, and was won so many times by the Punahou School team that the Club has given it on permanent loan to the school. On October 9, 1939, a new clubhouse was opened. Previously the clubhouse was located between the OCC and the Moana Hotel; it was later moved Waikiki of the Royal Hawaiian Hotel and remodeled. In 1965, the Club changed its name for the third time to the Uluniu Swimming Club and admitted men as voting members. This was in preparation for the loss of the Waikiki lease, when both Outrigger and Uluniu had to leave their Waikiki properties. The club no longer has a place at Waikiki; its last day on Waikiki Beach was June 26, 1968. In the 1970s, the club purchased the present clubhouse property in Lāʻie, overlooking a large coconut palm-lined lawn extending to the beachfront. Members and their guests can stay at the clubhouse, “Kaiwao” (literally, “inland of the sea;”) it’s located just past the Polynesian Cultural Center. It’s actually a beach house used by members as an overnight-retreat. With about 100 members in the club, members share responsibility of management and care for the house. In 2008, about five-decades after first visiting Uluniu as a little kid, I joined the Uluniu Swimming Club; we enjoy our retreats to the beach house. The moʻo were slain by the demi-hero Kana and his brother Nīheu. 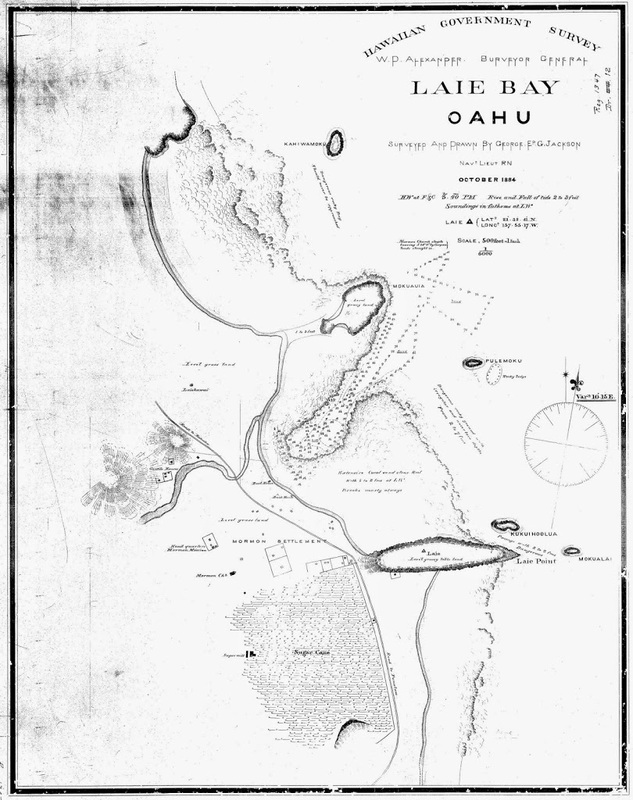 When the brothers killed the monsters, they chopped them up into the five islands off shore of Mālaekahana and Lāʻie. Some say Beauty Hole got its name because a beautiful old woman with long grey hair would come to swim during each full moon, and then sit on a rock under the moonlight and comb her hair. Located across from where Foodland is now, the Beauty Hole eventually got covered over in the 1960s and built on. “Shaka” is not a Hawaiian word (it’s not clear when or how it came into use) – but it is believed it started as a Hawaiian hand gesture and has grown to universal acceptance. Most point to Hamana Kalili (June 18, 1882 – December 17, 1958) as its originator. 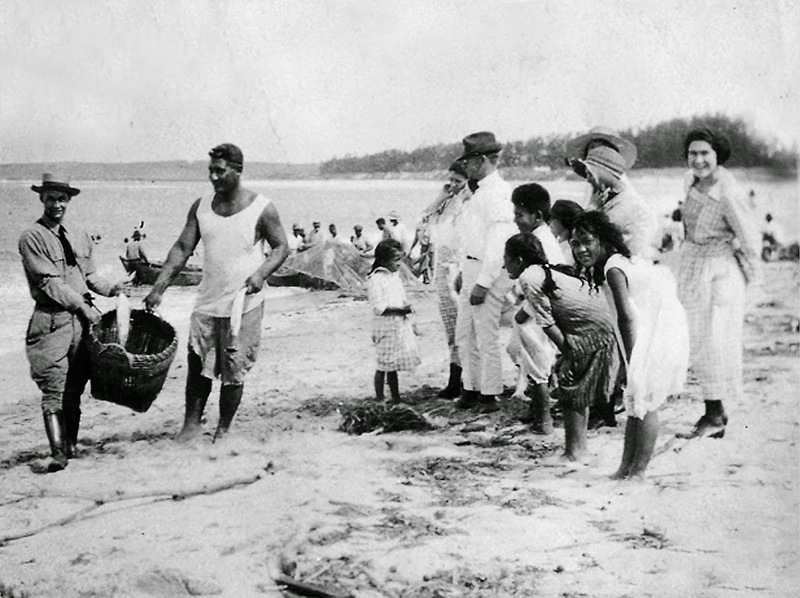 When fellow Mormons in Lāʻie planned a hukilau to raise funds to replace their chapel that had burned down, they turned to Kalili, a renowned fisherman, for help; Kalili supplied the nets for fishing. 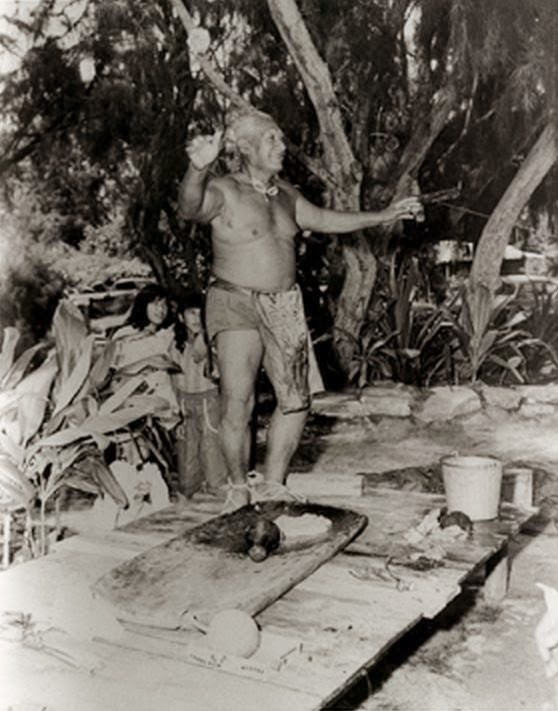 He also portrayed King Kamehameha during the entertainment portion of the hukilau. To make a simple Shaka: make a fist (not a tight fist;) extend both your pinky and your thumb and lightly shake your hand. (The Shaka sign resembles the American Sign Language letter for Y.) There are multiple variations on the finger extension, speed of shake, etc. Kalili’s Shaka didn’t start this way. Politicians used the “Shaka,” as well. Frank Fasi used it while campaigning for Mayor of Honolulu in the mid-seventies. In a 1999 Star-Bulletin interview, Fasi credited the late Bill Pacheco with using the sign and saying “shaka brother.” “I think he meant shake it up, buddy. How’s it going? Aloha. Have a good day. All those good meanings. It just meant a world of goodness”. The image shows Hamana Kalili. In addition, I have included other related images in a folder of like name in the Photos section on my Facebook and Google+ pages.